If watch brands were Facebook relationship statuses, Franck Muller would be “It’s complicated”. Not because the Swiss-based manufacturer has commitment problems but, rather, quite the opposite. 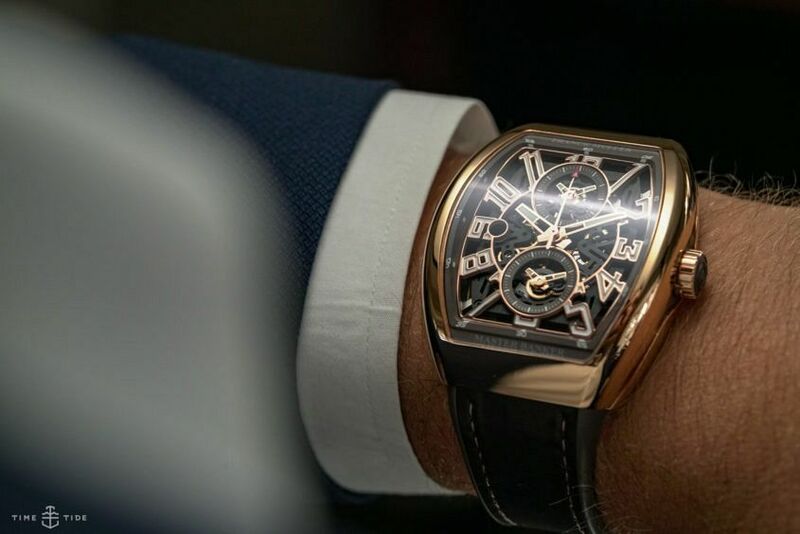 Since its beginnings in Genthod – located in the countryside of Geneva – the innovative brand has been committed to upholding its reputation as the “Master of Complications”. And the latest addition to the enduring Master Banker collection shows off its inner intricacies with a fully skeletonised dial and movement. Vital statistics The perfect picture inside the elegant curves of the trademark Vanguard case. The open-worked dial not only gives view through to the skilfully skeletonised automatic calibre inside but also displays three separate time zones. The central hour, minutes, and seconds hands tell the local time and are synchronised to the date aperture at 9 o’clock. While sitting above and below are two sub-dials, which along with the central time are adjusted via the same crown. The real kicker, however, is that both the hour hand and the minute hand of these sub-dials can be independently adjusted. The wonderfully tonneau-shaped rose gold case measures 44mm wide by 53.7mm long. And a rubber-lined leather strap holds it close to the wrist. Initial thoughts While…The post INTRODUCING: Three times the charm – the Franck Muller Vanguard Master Banker Skeleton appeared first on Time and Tide Watches.